The Leave No Trace (LNT) framework promotes training, educating and inspiring others, and one way this is accomplished is through encouraging Trainer educators to continue to lead. (What is a ‘Trainer’? Someone who has completed a 16-hour Trainer course). 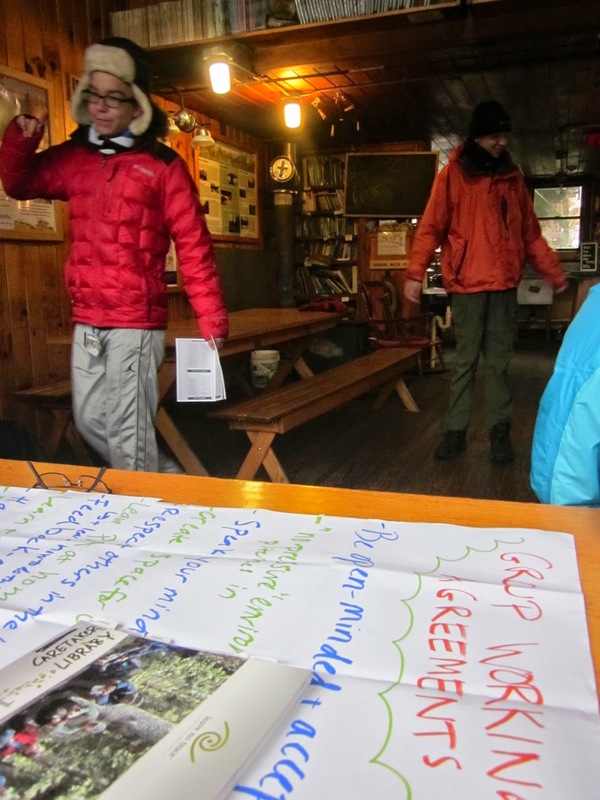 Last May I co-instructed a Leave No Trace Trainer course with a group of students from Phillips Academy Andover’s OutdoorPursuits (OP) program, and this past November weekend, two of the students I led in May served as my co-instructors. This partnership and unique educational set-up is partly due to myself. As an alumni of Phillips Academy, as well as of OP, I wanted to give back to the experience and program that had given me so much confidence and validation. A discussion with Mark Cutler, the current director, led to the inclusion of the LNT Trainer course into their ‘Sense of Place’ course, which is wild blend of experiential learning, OP principles, and history and philosophy. Outdoor Pursuits (OP), formerly known as Search and Rescue, turns 50 years old this year and is also famous for being founded by Josh Miner, the same outdoorsman who went on to found Hurricane Island Outward Bound. OP includes many of the expeditionary learning principles of Outward Bound (and the National Outdoor Leadership School), and has that similar mix of team building, self-driven learning, and the opportunity and space for personal reflection. When I was an Andover student, (and it wasn’t all that long ago, a mere 15 years), the technological world was much different. There was no email. There was no texting. I had no cell phone, and my computer, a first generation laptop, was the size and weight of the concise Oxford dictionary. Cameras used film and videotapes. For all these reasons, the OP experience has become all the more precious. The need for time away from technology has been fairly well discussed across the landscape, but I invoke it now because it was so apparent to me when I led these students, students who were not so different from me, but yet so different in so many other ways. We spent the next two days wandering through the ethics of Leave No Trace. We discussed simple scenarios and complex personal ethics. We wrestled with impacts in the backcountry, and what it felt like to still see those impacts on their campus. The students, as to be expected, were articulate, engaged, and curious. And, of course, still teenagers, the kind that threw snowballs and acted a little silly during games of UNO. The closing circle, after each student had given their presentations on the seven LNT principles, was one of deep reflection. Students applied their learning and experiences to their lives moving forward. Some of it applies to functional things like trip planning and backcountry travel, but some applies to the nuances of interpersonal communication and education. Rebecca and Owen, my two co-instructors, shone early on in the course as they led parts of the classroom portion. They continued to shine throughout as they modeled excellent feedback, supported participants, and were willing to be vulnerable and share their own challenges and ‘teachable moments.' I myself valued my time with the students, as they were inspiring, creative, and totally engaged with the ethics of Leave No Trace. The girls in the group, ready to head home from Zealand. On a more personal note, throughout my career in natural resources, in my stewardship of wild places, I have become thankful for the seed of validation that came from Search and Rescue (S and R)/ OP and my time at Phillips Academy. What I learned was confidence, in my choices and in my being, and the importance of time spent in wild places to cultivating self and spirit. What I strive to give back, as I lead current OP students, is that same unexpected validation that it’s ok to follow a different path, to give them the tools that create the ‘I’. It is pretty straightforward (and very difficult to resist) to draw a line connecting my S and R experience to my gravitational pull to work in the woods and live in a rural area, to directly connect the Sanctuary to the White Mountains, to connect my first weekend backpack to Moosilaukee to the months I lives in the backcountry. The problem is that doing so suggests a simple narrative, easily translatable but, also, highly simplified. Doing so fails to acknowledge the myriad of pulls and decisions and disruptions that have affected my life’s course. The role that S and R had in that narrative thread is that it was one part of a long series of experiences that continue to inform my life and work. But, had it not been there, my life would be lessened.